With Thanksgiving less than a week away now, I thought it might be a good day for a double dose of sweetness. Don’t forget to check out today’s other post, pumpkin pie! Sometimes instead of picking out the melon from my fruit salad, I’ll give it a try, just to see if I suddenly like it. I don’t (still tastes like watered down perfume to me) but I try because you just never know. Like for example butterscotch, cooked carrots, and small pieces of apple in foods like Stuffed Acorn Squash or Asian Lettuce Wraps. I never liked any of those things, but over the years my tastes have evolved. Which is really great for someone that loves food as much as I do. 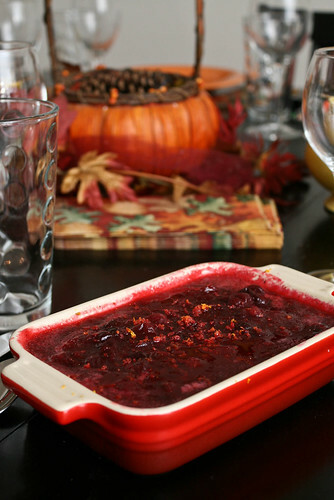 That’s sort of what happened with cranberry sauce. Every Thanksgiving I would put a little on my plate, give it a try, and pretty much always decide that there were just more important foods on the plate. That may still be a little true (the part about there being more important foods on the plate) but I’ve really come around in the cranberry sauce arena. It’s not my favorite food on the table at Thanksgiving, but it’s totally necessary, especially when you have a delicious recipe. With hosting a Thanksgiving meal on my own for the first time this year, I searched for the perfect recipe. And I think I found it! A little sweet and a little tart. The only changes I made were to cut the recipe in half (and it’s listed that way below). And bonus, I re-purposed the leftovers into a killer muffin. In a medium saucepan over medium heat, dissolve the sugars and salt in the water and orange juice. Add the cranberries and cook until the cranberries begin to pop (this part is fun! sounds like popcorn!) 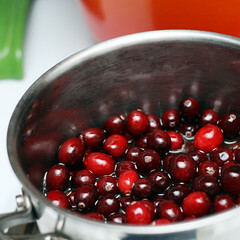 Cook cranberries, stirring occasionally for about 10 to 12 minutes, until the sauce thickens. Once thick, remove from heat and add stir in the orange zest and vanilla bean. Cool to room temperature and store in fridge until ready to serve. For a nice touch, garnish with a little orange zest when serving.